Rivers Wood Products takes pride in offering the highest quality materials for all your exterior and interior projects. We carry the largest selection in stock of Alaska Yellow Cedar, Trex, Certainteed Products, and Pine Boards. We offer stainless steel Ultra-tec cable railing assemblies that are attractive and preserve the view from your deck or stairways. We can also provide the fastening assemblies to build your deck, and finishes to beautify and preserve your wood. Whether you are building a deck, siding your home, starting a new home or garage, or remodeling, Rivers Wood Products can supply the finest materials. Since 1984, our team of dedicated professionals have committed themselves to providing the highest quality service to our customers. 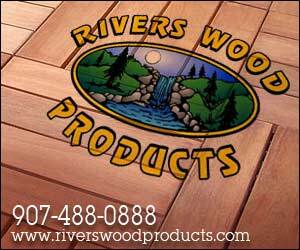 Rivers Wood Products offers our customers personalized, individualized service. Our commitment to quality and customer service has earned us a great reputation and loyal following among contractors, carpenters, homeowners, and "do-it-yourselfers". Drop by or give us a call and find out for yourself why so many Alaskans choose Rivers Wood Products for their building needs. The team of professionals at Rivers Wood Products know the products we sell and understand your building needs. Our friendly and knowledgeable staff can answer your questions and help you select the best materials to meet your needs. We aren't another discount box store. Owner Kelley Rivers and manager Doug Scherzer are long time Alaskans who know construction challenges in Interior Alaska, and they use the products we sell. Our employees know our product lines, and are eager to help you accomplish your projects goals, whether you are building a new home, remodeling, or adding a new deck, fence, or railing. After months of anticipation, we finally have our H&H trailers in our yard! 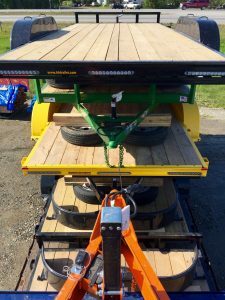 Brand new tandem axel 16′ flatbed trailers are available. All you need to do is pick a color! Available in green, blue, yellow and black.